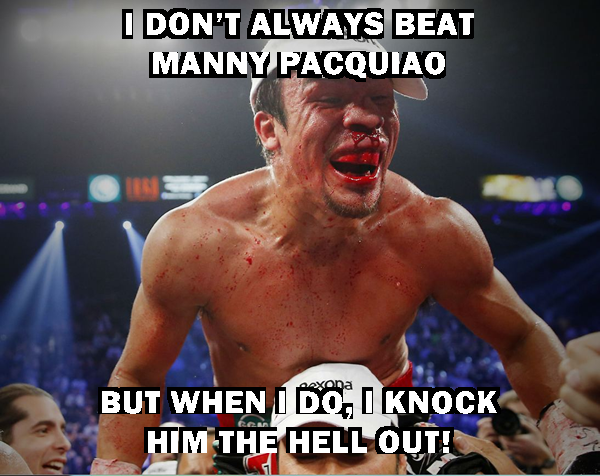 I don’t always beat Manny Pacquiao… but when I do, I knock him the hell out! Take a look at that bloodied up and battered face of Marquez… that’s the face of a champion who would do anything to win against his rival. Gotta love that image, and gotta love the way that Pacquiao vs. Marquez played out. Unforgettable stuff. Enjoy the Pacquiao-Marquez meme, and be sure to keep on checking out the rest of our daily boxing news coverage at ProBoxing-Fans.com.